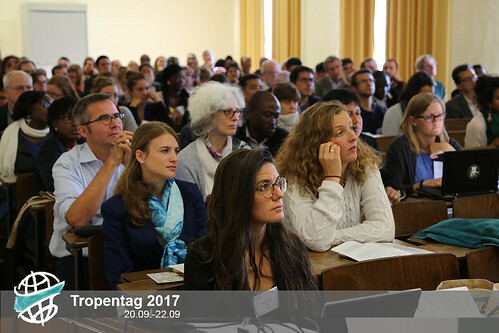 Halfway through Day 2 of Tropentag 2017, limitations to productivity seem to be a recurring theme across many disciplines. Bulle Dabasso, from the University of Nairobi, described to his audience a bottleneck in economic potential, the limited market value of lean animals in Kenya. His study provided a detailed description of Stratified Cattle Production (SCP) as an option for improving market value for lean animals, therefore increasing the economic potential of pastoral livestock production in Kenya. Debasso's explanation of the necessity of addressing this bottleneck seemed relevant in the context of his research, but I was left desiring further exploration of the social and ecological limitations which almost certainly also work to impede productivity. Certainly, I'm not the only one. Is it not fair to say that research in #FutureAgriculture must consider not only the economic limitations of moving towards productivity transformation, but also the ecological and social limitations embedded within context-specific research? 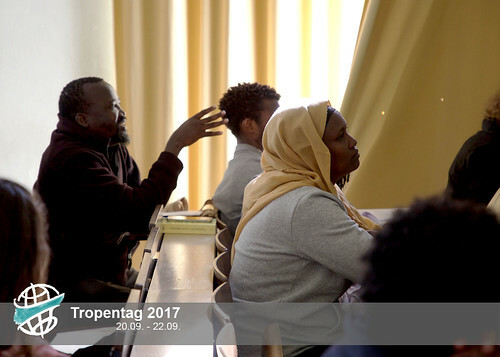 Among the six presentations during the "Markets" oral sessions this morning, Nkoyo Bassey from the University of Bonn caught lots of attention. Her work promised to bring many benefits to farmers in Ghana by applying quality grading standards for maize to reduce post-harvest loss (PHL). In her research "Marketers Consciousness for Quality Loss Reduction: A Case from Maize Marketers in Ghana", Nkoyo Bassey and her team experimented and analysed the influences of establishing a standard grading system for the quality of maize produced by farmers in two districts in the Brong-Ahafo region of Ghana. Until now, the quality of harvested maize grains was decided mostly subjectively according to its physical appearance by farmers and buyers. Therefore, there is an increased possibility of losing certain amounts of usable grain, which costs the farmer. By comparing the existing scenario of current market situation on subjective grading and the hypothesized scenario with grading systems, her research found out a significant impact of grading standard. While the former scenario showed a low acceptability of marketers (around 44%), the latter one clearly confirmed the benefit of grading scale with a double rate of acceptance. 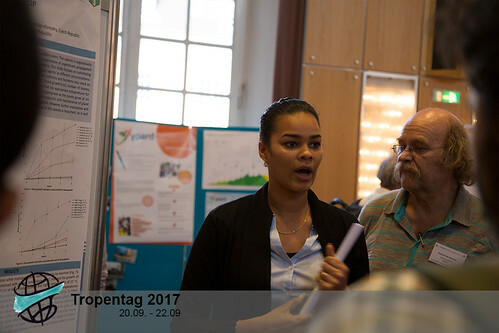 After the interesting and inspiring first day at Tropentag 2017, people dragged themselves out of their beds to the AULA at the University of Bonn for today's morning poster session about land use and land use changes. 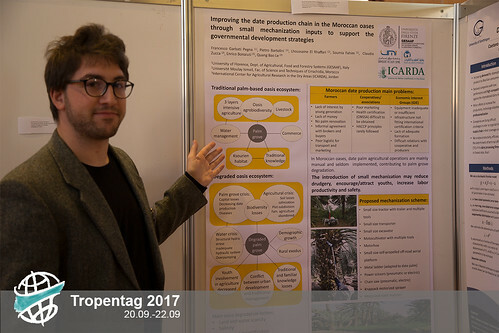 Andreas Brueckert, head of the department of Organic Plant Production at the University of Kassel, guided us charmingly through the jungle of posters. Personal eye- and ear-catchers for me were the presentations on how the future of tea in Malawi depends on the changing climate, tenure influences land conservation, and sustainable land management works in the fragile political context of Northern Afghanistan. As the presenter did not show up, Andreas, who was well-prepared quickly took over and concisely explained the study. He spiced it up with facts he already knew from his own research, like one major obstacle for planting trees in the socio-ecological context is the change in ownership. The one who plants the tree automatically owns it. Therefore, land tenure hinders the implementation of land conservation methods, slowing afforestation in communal land. Christian, demonstrated another threat, not to trees but to tea. During an intensive modelling study he and his colleagues investigated the impact of climate change to tea production in Malawi. Whereas just few areas can sustain their production with incremental adaptation, large areas are at risk. As tea is an important crop for agriculture in Malawi, this outcome poses a big challenge for both farmers and researchers, as resilient varieties are needed. Should It Be Out of Our Hands? Cast under the soft morning light of an empty hall, Poster Session 2 "Markets" began in a far more intimate fashion than the session held in the space yesterday afternoon. Perhaps the combination of a smaller audience, a quieter surrounding hall (and copious coffee personally) worked together to generate conditions for a far more interactive discussion of forward-looking market-centric research. As a self-identifying young researcher (one of the dominant themes of yesterday's Welcome Address), I am currently deeply engaged with preparations for my first poster presentation at an upcoming conference later this autumn. The opportunity to follow multiple poster sessions this week has of course reiterated the necessity of certain characteristics in delivering an effective poster presentation, but perhaps more significantly, it has unveiled a dimension of "Well, this is out of my hands..." that seems inherent to this particular form of scientific communication. I am specially referring to the presentation time and poster location. Does the random selection of your presentation hall, or whether your talk precedes or follows a coffee break, significantly impact the effectiveness of your poster presentation? With no control over these factors, I would like to ask senior researchers for advice moving forward: What strategies have you cultivated to navigate some of these challenges? How can young researchers improve for future international conference environments? Tubers that don't want to grow up! Conservation of genetic resources is a crucial mean for safeguarding the agriculture of the future. However, medium to long term conservation of germplasm requires significant effort, expecially for vegetatively propagated plants, such as tuberous crops. Stacy Hammond from the Czech University of Life Sciences conducted a brilliant investigation on how to effectively slow down the growth rate of Ulluco (Ullucus tuberculosus)(Loz.) of the Basellaceae family, an important Andean staple crop, so it can be efficiently conserved for farmers and for future generations. I certainly hope that these findings will serve as a basis for future studies in genetic resources and conservation.